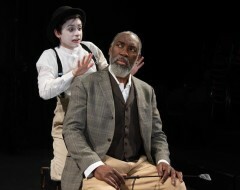 Harry Watermeier and Charlotte Northeast in Azuka Theatre’s production of SHITHEADS by Douglas Williams. Set by Apollo Mark Weaver and props by Avista Custom Theatrical, LLC. Photo by Johanna Austin/AustinArt.org. I love subcultures: all that arcane lingo to sling around, the gear, the handshakes, the obsessive devotion to detail, and the strenuous opinions about the best. 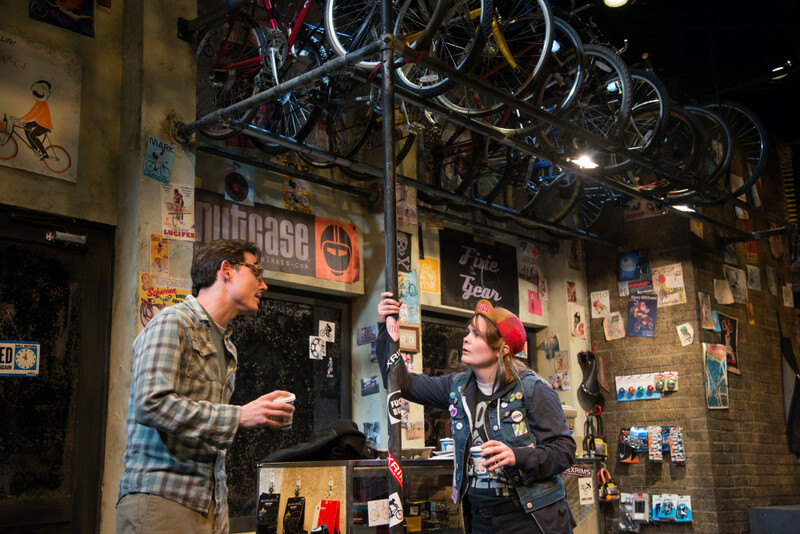 Azuka’s terrific production of SHITHEADS, a new play by Douglas Williams directed by Kevin Glaccum, is about the New York bicycle subculture. It shows us the shops and the people who work in them—building bikes, fixing flats, and rhapsodizing about how the city looks if you’re riding instead of taking the subway. As somebody who doesn’t ride, I can’t really judge the authenticity of SHITHEADS, but I was completely convinced that this funky world was the real deal. Mostly this was because the actors are terrific—endearing, funny, with a depth of character that is absolutely compelling. 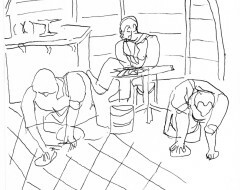 There is a plot, but it’s thin: this is a play based on character, but if it has an theme, it is a lament for the way little businesses run with passion and specialized skill are being elbowed out by big, glossy stores. It’s an old story by now, but it becomes truer in the retelling. 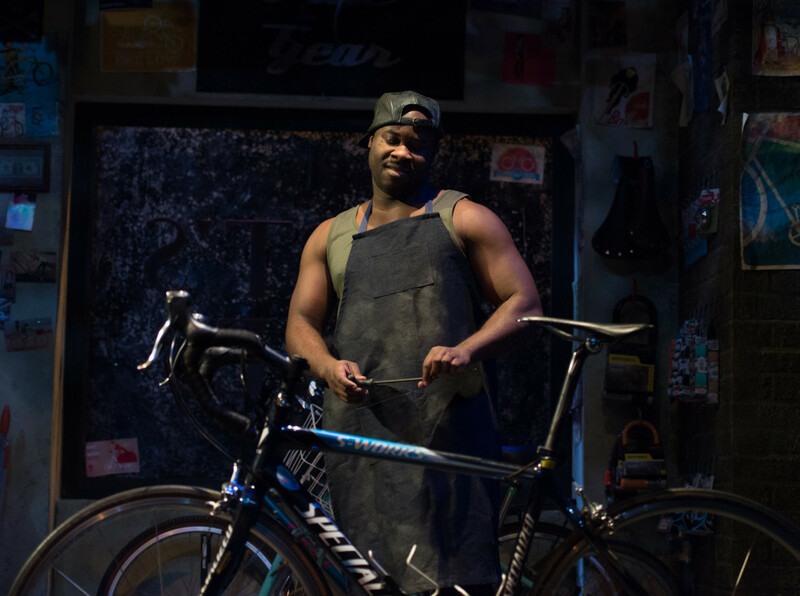 The powerhouse of the show is Akeem Davis as Alex, who manages the shop for the absentee owner. Davis has just finished as Marcus Garvey in InterAct’s Marcus/Emma and he brings the same high energy and physical fuel to this role. He can talk on the phone and make it look like an Olympic event. Akeem Davis in SHITHEADS. Photo by Johanna Austin/ AustinArt.org. Equally engaging is Charlotte Northeast as Izzy, a tough, jokey, messy-looking woman whose skill set includes building a “6” from scratch. When you have seen Northeast before it has probably been in a production from Philadelphia Artists Collective, where she is elegant in diction as well as in Renaissance gowns. The new hire in the shop is Brandon (Harry Watermeier), aka “College,” a young guy who knows nothing about bicycles but learns. 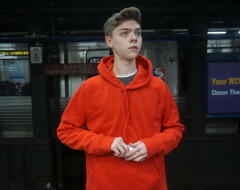 I suspect he’s the stand-in for the playwright since Brandon is a writer and is writing a story about the shop. Spider (David Pica) is the stoner bike messenger who drops in regularly and makes us wonder how anything ever arrives at its destination. [Proscenium Theatre at the Drake, 302 S. Hick's Street] February 22-March 12, 2017; azukatheatre.org.